Hey, nice to see ya! Well the power is finally back after 106 hours. Was it awful? Not at all. A dark house provided great impetus for getting out and doing things and we made the best of it. The only downsides were really cold showers and the need to drive to the local shop at 6:00 AM for morning coffee. But cold showers are invigorating and going out only for coffee when I usually have to go to work was rather nice. Hurricane Irene seemed to be more hype than horror as we waited out the storm on Sunday. We lost our power at 4:00 AM Sunday morning but suffered nothing more than a coating of leaves and branches in our yard. There were plenty of downed trees in the neighborhood but it still felt more like a bad storm than a hurricane. Except that the power never came back on. I went for an early neighborhood run on Monday morning to survey the damage and saw nothing too disturbing. Apparently the real damage happened out of sight. 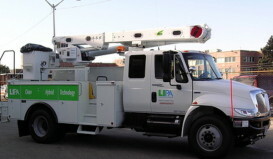 We didn't see a LIPA truck for days and LIPA's communication was simply poor. That's all I'll say about it but I expect that LIPA officials will have a lot to answer for. My run went well and though I felt I was running slower than normal, I was actually ahead of my usual pace. It probably had something to do with running after I'd had time to wake up. Tuesday was basically a copy of Monday's run although I followed different roads in hopes of seeing a LIPA crew at work. No luck there. Yesterday I decided to head to Stillwell for communing with nature and, when I arrived, the entire high school boys cross country and track teams were trotting towards the trail head. I followed them in a few minutes later. The trails were surprisingly clear. I'd expected to see lots of downed trees across my path but Stilwell looked the same as always. About a mile into the run I encountered the high school team coming from the other direction. The fastest boys had broken away and were swiftly turning toward a hilly section. The second wave greeted me cheerily and I returned the hellos. The last wave were not so happy and some of them had stopped to catch their breath or tie their shoes. It was not going to be a good morning for them. I followed my normal loop a couple of times and finished up with my longest run since Saturday's 7.1 miles. I do need to push my base training up to six miles and, now that we have a heated shower, I'm considering an evening run tonight. In truth, we've been running around so much this week that I'll probably consider this an ad hoc rest day and go out tomorrow morning instead. I'm pleased that we're back to "normal" and that I still have a few days left of vacation to enjoy modern conveniences. Well almost. We still need to refill the refrigerator and have the automatic garage door reset. Being without power didn't stop me from my running. But, everything being equal, I'd have loved coffee on demand and a warm shower after my runs.